My Tribute To The Greatest Fans On The Planet: Clevelanders. Why do sports make us feel this way? Why is it, that when athletes emerge victorious, so do we? We look to them for comfort, support, and as one Clevelander put it, as “a pleasant distraction” from “the other things in life” besides sports. Grown adults and children alike are hypnotized by the power that sport has on the human soul. The answer is not a very complicated one. These athletes, no matter where they are from, are part of a team. That team represents a city and her people. They are indeed one in the same. Before Sunday night, the last championship that the city of Cleveland won was in 1964 with Jim Brown and the Cleveland Browns football team becoming NFL Champions. In the 1960’s, the city of Cleveland really took a turn for the worst. The once industrial giant, a crowned jewel of the steel industry, began to die. Jobs and opportunity left Cleveland, and the sports teams reflected that struggle and heartache felt by Northeastern Ohio. Time after time, the Indians, Cavs and Browns ripped the heart out of Cleveland with a sports history that is known to most sports fans in the United States. So often the teams would come so close, only to end up so far. It created an almost comical attitude surrounding Cleveland sports, and ultimately should have ended them completely, as fans should have stopped coming and supporting the local clubs. When Art Modell moved the Browns to Baltimore in 1995, it should have been the end for Cleveland football. But for some strange reason, Cleveland wouldn’t let their team go. They fought and fought to get it back and it got its wish in 1999 when a new Browns team emerged, though they yielded similar results as the last franchise. And yet the fans still showed up, decked out in Cleveland gear, cheering just as hard as the last game for their team. We still have blind optimism for the Browns every August, and still are thinking about playoff chances at 3-7. We love our Indians and wear our rally caps and cheer down 6 runs in the 9th inning. And we love our Cavaliers who suffered the heartbreak of LeBron’s “Decision” in 2010. Cleveland fans are just… different. We’re a little crazy, a little irrational. We keep getting our heart broken but we come back for more. Some say it’s something in the water over here. Or perhaps the dark, gloomy days year-round make a thumping on the Browns look almost up-lifting. Or maybe, it’s the love that’s here in Cleveland. That’s the thing that holds this sinking ship together. 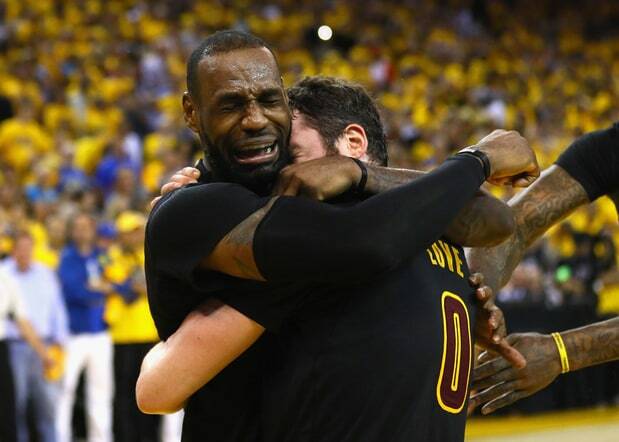 When I watched LeBron hoist the Larry O’Brian Trophy on Sunday night, I knew what this would do to my city. Cleveland, we’re going to be okay. If we can get through the 52 year drought, we can get through anything together. All it takes is a little faith, love, and as many Clevelanders will openly admit; copious amounts of alcohol... The fierce devotion to family roots, to the city itself, and to our teams show just so much we love this hell-hole we call home. No matter where life takes me in this world, Cleveland will always be my home. It’ll always be a place that I feel pure, true, deep, love. Go Tribe, Cavs, and Brownies.